For the majority of people Laos is best known for it's association with the Mekong River, ethnic jungle villages and the "Land of a Million Elephants." Previously, the Kingdom of Laos, it is now referred to as the Lao People’s Democratic Republic, and better known as the rallying point for expats hunting down a new long-term Thai entry visa. I recently returned from one such trip to its capital Vientiane, and managed to gather enough imagery and info to warrant this short blog post. After my first trip to Vientiane back in 2009 I was struck by the present scale of economic development in the city and its suburbs. Vientiane is in the midst of transformation from what was a small sleepy border town neighboring Thailand, to a large city of commerce and development. The transformation of Vientiane is on a scale that parallels, in some ways, that of its Chinese neighbor to the north, with building and infrastructural development being at its heart. This is partly a result of Chinese investment capital entering the country to secure access to natural resources and agricultural development rights in Laos northern provinces. With other sectors such as Foreign NGOs and big business tapping into social economic change and seeking a foot hold in the emerging economy. Vientiane is home to a large number of western entities with an emphasis on "Economic Aid" through organisations like the United Nations Development Fund and WWF. To note: I managed to spend some of the little time I had visiting WWF and UNDF offices in search of NGO positions for foreign workers. This also lead to a publication called 108 Magazine that advertises industry positions for locals and foreign workers - international companies such as ANZ Banking Group, Ford Motor Company and Red Cross. The majority of adverts for recruiting foreign and domestic workers in Laos are found in the mining sector, education, translation and IT. With the larger recruiter SNAP for Data Analysts and IT. Large corporate ventures are now located in Vientiane, although they seem to be gathering capital and investment from China beyond intellectual property (IP) in Tech based companies and UN funding projects. 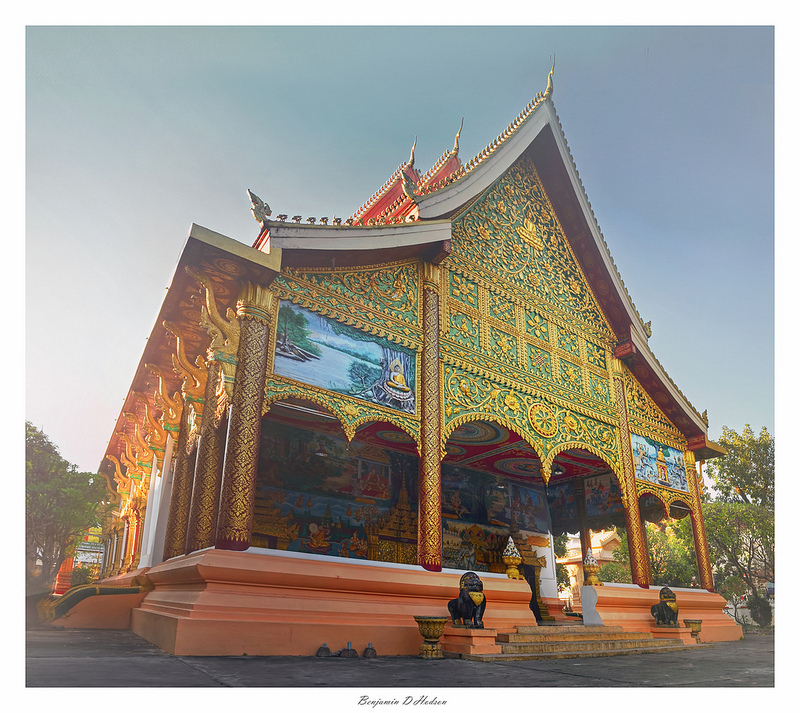 With regards to my photographic work in Vientiane: I managed to visit the Royal Palace and several Buddhist compounds that were situated a short walk from my hotel on and around the main avenue of the city. Generally, the city is a hive of activity during daylight hours which petered out by nine o'clock and feels much like the implementation of a general curfew by midnight. This reminded me of Hanoi, Vietnam where the population shares a similar social trait. Nevertheless, development is everywhere and although I ran out of time to visit some of Vientiane's better landmarks there are an abundance of new temple complexes that have been developed and rejuvenated in recent years. These seem to be on a scale that mirrors the current economic climate. The following set of images where taken at sites around the city and are high resolution artworks available for purchase or licencing. If you have any further questions please feel free to contact me using the information provided.